﻿﻿We offer a variety of services, and we can customize the inspections to meet the individual needs of our clients. Read through the descriptions of our inspections below, or click on the button to see all of our certifications. Also, check out our testimonials to see what other clients think of our service! A comprehensive inspection is conducted to include the ceilings, walls, floors, stairs, counters, cabinets, windows, electrical systems, plumbing systems, heating and air conditioning, sinks, toilets, showers, tubs, and any appliances remaining in the home. A thorough inspection is done on the roof, exterior walls, doors, windows, decks, patios, porches, drainage, driveways, garage, foundation, grading, and any landscaping affecting the home. We also inspect sprinklers, outbuildings, outdoor cooking equipment, fire pits, children's playsets remaining with the home, and just about anything else you need us to look at! Our assistant inspector is a pool expert with over 5 years of experience in pool companies. We look at the mechanical features of the system including the pumps, filters, and heaters. The liner, coping, and deck are also visually inspected. 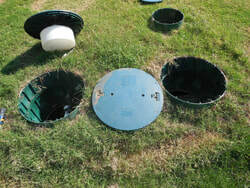 We are certified to inspect both aerobic and anaerobic septic systems. A bacteriological test is performed on wells and clients are provided with the lab results. Additional well tests can be requested. Every home is important, and we apply the same level of professionalism and standards to all homes. On mobile homes we also inspect underneath the home, looking at the plumbing, sewer connections, vapor barriers, dryer vents, heat and air system, foundation blocks and tie-downs. When the indoor air quality of the house is compromised, a complete mold inspection is recommended. This includes two outdoor air samples, plus the recommended indoor samples based on the scope of the problem. We also visually inspect the exterior and interior of the home for any issues relating to mold. We gladly accept cash, check, PayPal, and debit/credit cards! We can also be paid at the time of closing for real estate transactions, however a $50 closing fee will be added to the invoice.